Forget the lies you have been told about Bitcoin. Bitcoin doesn’t stop banking, it doesn’t even stop central banks. In fact, central banks were born using a gold standard. The first central banks actually had a one-to-one reserve requirement. It didn’t last long, and they realised that they could do a four-units-to-1 gold standard in the British central bank. The fact of the matter is: there is little difference between bitcoin held with Coinbase and the modern banking system. We have a vision of systems that are built on the Bitcoin blockchain, which maintains a global, open ledger. It is the vision of a single ledger, so that banks, governments, and corporations cannot fudge the numbers. We have a vision of a system that is not required to and does not need to keep full private keys to access customer funds in the blockchain. We have a vision of a new financial system where we can have a partial seed system with the user such that if we are hacked, the funds cannot be moved because we don’t have all the seed parts. We have a vision of a system that allows you to maintain all your assets, to keep invoices, and to track all expenses over time. A system that automatically returns all tax records and that can allocate them based on the information provided by the user. A system that does not allow you to cheat and use someone else’s records or to copy an invoice from another party. We have a vision of a system that allows users to manage all their assets and finances from anywhere on earth cheaply and simply. We imagine a system that provides a simple account-keeping interface, one that in vein is similar to traditional banking screens for familiarity, yet the e-Wallet far surpasses traditional banking in usability, code efficiency, backwards and cross-device compatibility (computers, tablets, and mobiles), and that “of-course” factor where the software itself is invisible to use. The truth about Bitcoin transactions is that they take roughly 10 minutes to settle, but they take only fractions of a second to propagate across the network with a minimal fee and tip. We envision a system where we do not sugar-coat any of it, and show users in real-time how their transactions are going with understandable statuses like Transaction in progress, confirmed, and even failed and contextual explanations. We envision a system where we are frank with our users so that they know and can act accordingly and immediately. Do you want to lock a certain amount of bitcoin away until a set date? Such capability is encoded into the DNA of the original design of locked wallets and storage procedures, and because the keys never exist. Our philosophy on security is also fundamentally different from one held by those who use obscurity of information and hide to stay safe. Even if our cold-storage architecture is known and our internals compromised, our security lies in the genetic building blocks of our transactions and keys. We focus on atomic security rather than assurances. The thing people try not to tell you is that Bitcoin becomes stronger and more powerful the more it is used. Not because people HODL, but because they use Bitcoin on a day-to-day basis, paying fees to miners and ensuring the strength of the network increases. With our own developments, we do not depend on open-source code in critical areas. We’ve built on top of algorithms like Shamir’s Secret Sharing Scheme and Elliptic Curve Digital Signature Algorithms with code that is our own. We integrate dedicated random-number-generation (RNG) hardware in lieu of software RNG. By authoring our own code, we can inject line-by-line performance and tuning methodologies and need not be restricted to only using tools. Every fee is calculated dynamically per transaction with the specific instance’s variables and bit-count so that every fee is exact, instead of relying on categories and tiers for fees. We have a vision of a system that will allow users to ‘tip’ a bit extra for each transaction to hasten it; however much they want. Our competitors with their (bastardised) copies of Bitcoin (BTC, BCH) have largely skirted around being scared of imposing additional fees, but we don’t see an issue here at all. 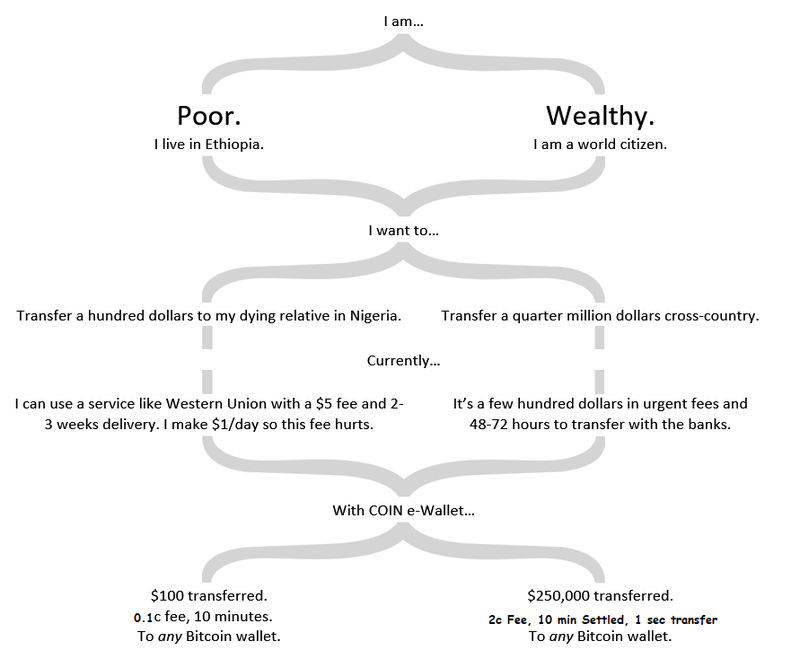 It is the closest truth to how Bitcoin really works, simplified. 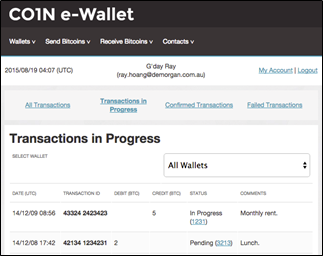 Each transaction on a bitcoin e-Wallet uses a newly generated set of keys. The open ledger that is the blockchain means that anybody can see any transaction. When transactions start grouping around one re-used set of keys (or public address), one can start collecting forensic data on it (as we have). The same cannot be done with our transactions. Our users remain pseudonymous as the standard. We imagine a system where wild operators do not collect unnecessary data on users. Subpoena and police seizure? That’s fine. 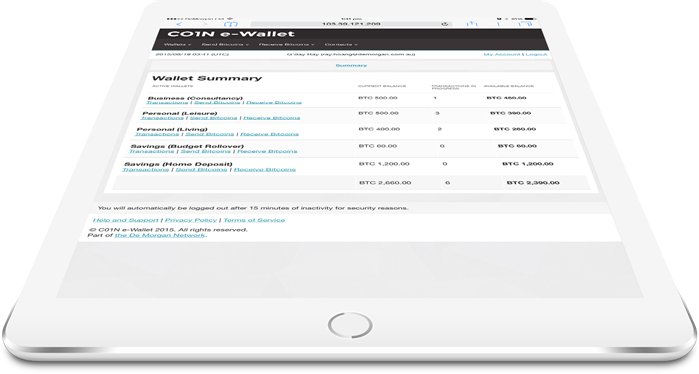 If you’re a global bitcoin-wallet application, bitcoins cannot be taken as we don’t have enough parts to access the funds, and we do not reasonably store any personal information on the users. Everything can apply using existing anti-money laundering rules and yet also require good old-fashioned police work. Just like credit or debit cards, every transaction needs to be signed by the user. The signature we have a part of, and the user has the other part. Together, the funds are accessed. Separately, they’re useless mnemonic seeds. The e-Wallet is just the tip of the iceberg, and the real beast is our flexible iDaemon Bitcoin platform. From day one we’ve drawn our plans to deliver something like the e-Wallet, an exchange and a bank with bitcoins. Now, we want to help others make it a reality. Not a world of bucket shops and ICO scams but one of global inclusive finance. A system that allows people to trade and be paid in any currency settled on Bitcoin in a secure instant global system. We have a vision of anyone being able to access their money, even if they can’t get a bank account. We have a vision of anyone globally being able to hold and manage assets and build a portfolio of investment items, no matter how poor they are. We have a vision of a regulated economy, but where regulators compete and are accountable. An economy where the best exchanges attract the best companies. We have a vision of an inclusive world, a world where fraud is expensive and rare and where people are held to account for their actions. We have a vision, and it is Bitcoin. Thanks to wer5lcy, Jerry David, tonesnotes, and Will Devine.